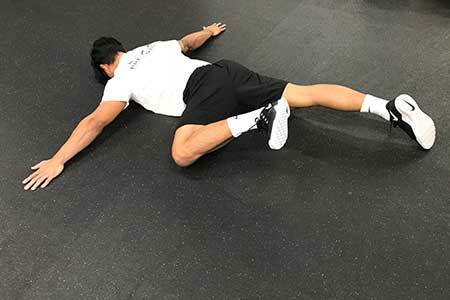 The importance of activating the gluteal muscles can help maximize your training regimen as well as prevent injuries, often distal to the hip joint. It’s imperative to prime the gluteal muscles and the smaller stabilizer muscles in the hip prior to squatting, deadlifting, or any lower body movement to ensure the hip region is warmed up and ready for more complex movements. 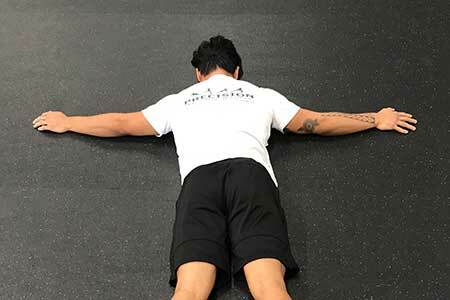 Too often, we see individuals jump straight into back squats or deadlifts without any focus on glute activation and wonder why their training sessions are lackluster. In order to activate the glutes, the core has to be turned on. Refer to the “Turn On Your Core” article and follow the suggested program before moving on to your glutes. To better comprehend how to effectively “turn on your glutes,” we must have a basic understand of the muscles and actions involved. 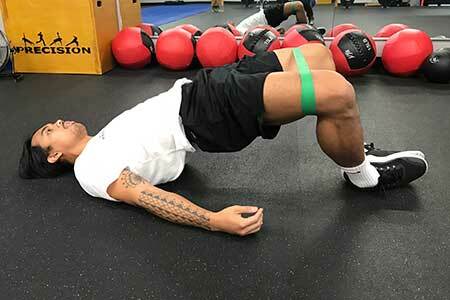 The gluteal muscles perform three main actions that effectively “turn on the glutes”: hip extension (extending leg back), hip abduction (extending leg laterally), and hip external rotation (rotated leg outward). However, there are many different actions the gluteals perform depending on the location of the muscle on the pelvis and where it inserts on the femur. 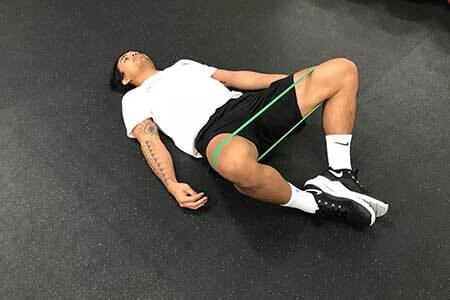 Therefore, moving the lower extremity in a certain plane whether it be sagittal (flexion or extension), transverse (internal or external rotation), and frontal (abduction or adduction), will accentuate certain fibers of either of the gluteal muscles. Listed below are three muscles that comprises the gluteal muscles as well as their actions. There are also other synergists muscles that extend, abduct, and externally rotate the hip. The muscles are listed below and are categorized based on the action it performs. These are extra information for those who like to geek out on kinesiology. Feel free to skip this section if you’d like. In addition to planar movements, your glutes also work to absorb impact and transfer energy from one side of your body to the other… a subject we will address in our future blog Running Mechanics, Off Season Training. To ensure they are working properly and efficiently, try adding these three foundational moves to your exercise routine. While this is not an extensive list, these are a few that we find helpful in activating the glutes before a training session or to re-educate the glutes to contract. The first two exercise will place the lower body into extension, abduction, and external throughout the whole movement. The third exercise only places the hip into abduction and external rotation, but this movement requires hip mobility, reason enough to be on our go to list. The first exercise is very simple but an effective way to learn how to properly engage the glutes on the floor. 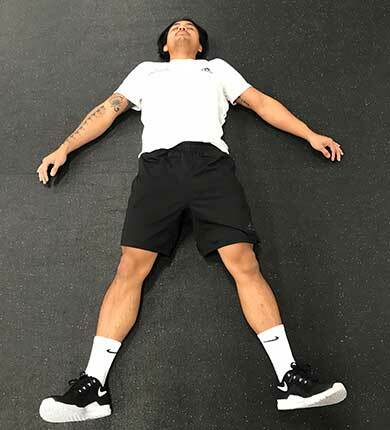 Simply lay on the floor with the both legs extended, feet wider than shoulder width apart, and pinky toes rotated towards the floor. The position of the legs will place them in hip abduction and external rotation. Squeezing the buttocks will move the hip into extension. Prevent pressing the heels into the floor and just lift the glutes from the floor. The goal is to lift the glutes until it feels like only the middle of the glutes are on the floor. The image below displays the starting position. Whie difficult to see in the photo, the glutes should be raising from the floor. This can be done without a mini-band if you don’t have access to one. If you do, place the mini-band just above the knees. Press both soles of the feet together and place the edges of the feet on the floor. The knees should be wide. Actively press the soles together as you lift the hips off the floor. There should be a straight line from the knees to the shoulders. Take a second or two to hold at the top to solidify the position before lowering the hips to the floor. This exercise is the most challenging of the three because it will demand hip mobility, but will target the gluteal region like no other. Lay prone on the floor with the legs straight and arms out, palms to the floor. You’ll perform this movement one leg at a time. Pick a leg to work on and flex the knee joint until the sole of the foot is facing the ceiling. Actively press the hips and palms into the floor and pull the knee off the floor. Then, pull the knee away and up from the midline; the hip and knee should roughly be at ninety degrees of flexion. Goal is to hover the knee over the floor and hold it for as long as you can. You don’t necessarily have to start every repetition with the leg straight if you don’t want to. Another option is to position hip and knee at roughly ninety degrees of flexion and lift the knee off the floor. Go with the option that feels most comfortable.